Fiery is a product range of the company EFI – Electronics for Imaging. While in the past the name Fiery was mainly present for controllers for printers, now proofing and production systems are marketed under the name Fiery. 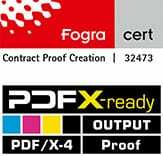 The popular proofing software “EFI Colorproof XF” was renamed in 2013 to “Fiery XF”. This entry was posted by Matthias Betz. Bookmark the permalink.